Posted on 4th December 2011 by Jules. Controliss Blinds showcase Lutron's award winning and imaginative Kirbé® Vertical Drapery System that represents an exciting and unique industry first. 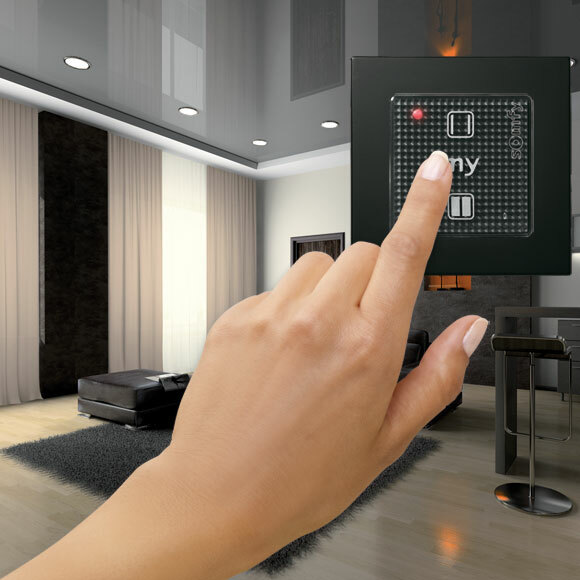 This entirely new design of Lutron blinds smoothly raises and lowers the curtain fabric up and completely out of the way at the touch of a button. The Kirbé vertical curtain system is a captivating fusion of vertical motion with Lutron's beautifully engineered quiet drive motorisation technology and traditional soft curtain fabrics. Lutron Kirbé eliminates “stack back” – the mass of fabric remaining when a traditional curtains are opened. Curtain fabric stack back can equate to one-third the total width of traditional curtains which in many scenarios can block a large portion of the overall window aperture. Utilising the unique Kirbé system increases the number of applications where you can use curtain fabrics, including restrictive spaces, French, Bi-fold or sliding doors and floor-to-ceiling windows by recessing the system into a recessed pocket for totally unobstructed access and views. The Kirbé vertical drapery system features a number of Lutron innovations that enable automated control of rolling soft furnishing curtain fabric in a window blind possible. Integrated Lutron QS, QED or QS wireless silent drives with limitless control options including Lutron HomeWorks, GRAFIK Eye QS, third party home automation systems or standalone remote control. Reliably and delicately smooths and pleats the fabric as it is taken into and let out of the top mechanism. Perma-pleat bottom bar™ Weights fabric and maintains a smooth and even ripple fold pleat to keep curtain fabric uniform. The finishing touch Finish the overall aesthetic with a beautifully finished matching fabric Lutron cornice to easily finish the look without the need for a recessed top pocket. For more information including quotations and PDF specification sheets please email info@controlissblinds.co.uk or call 0115 9311 911 to speak to an approved Lutron blinds specialist. Posted on 3rd December 2011 by Jules. Controliss Blinds head into December with a brand new enhanced website design, a new collection of the latest electric curtain tracks, Lutron blinds and our new Somfy shop for easy on-line ordering of Somfy's most popular controls. With increased usability and visual appeal the newly designed streamlined web interface provides Controliss web visitors with an unparalleled on-line shopping experience for configuring and buying electric blinds. Electric Curtain tracks Our exciting new range of electric curtain tracks feature the very latest technology in motorised curtain track systems. These amazing curtain tracks are ultimately included more and more frequently in high-end interior projects, both commercially and residentially, where effortless control maximum impact is desired. Offering very sleek lines over a span of up to 10 metres, these smooth running tracks, with Touch Motion facility are second to none. Lutron Blinds Controliss blinds recent Lutron dealership approval is now visible on-line with a dedicated Lutron Blinds section offering information about the amazing collection of Lutron Sivoia Shades including Roller, Roman, Venetian, Curtain Tracks and Kirbe Vertical Curtain system. Somfy Shop As if this wasn’t enough, the busy Controliss team have introduced a new user-friendly Somfy shop, showcasing a comprehensive catalogue of popular Somfy controls and accessories from Somy's versatile selection of Telis remote control handsets, home automation accessories; not solely for window blinds but garage doors and electric gate automation too! The new Controliss website, not only looks great, but the increased functionality allows our visitors to browse with consummate ease through our extensive ranges; whilst our Customer Support Team are always on hand to offer help and advice in choosing the perfect electric blinds. Posted on 3rd August 2010 by jenny. 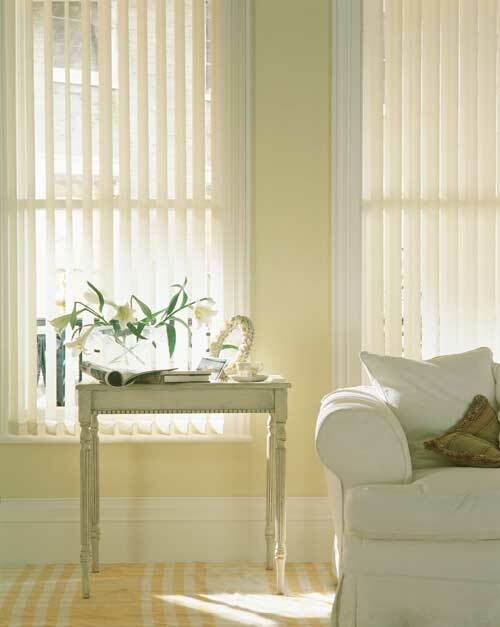 Are you feeling bored with your vertical blinds? Here is a design project you can do yourself on a weekend to cover the hardware of your vertical blinds with traditional curtains with a contemporary style. What You Need: Fabric of Any Material and Pattern Metal Ring Clips Two Tassels Trimming with Tassels Scissors Vertical Blinds Directions: 1. Cut half a width of fabric for each side panel. Using blind stitching, add side seams and hems. 2. For the valance, sew together two widths of fabric in the center and hem the panel. Prepare a scallop-shaped pattern on paper and use this to cut scallops along the top edge. Use a basting stitch into the panel to keep the valance from falling apart. Add the trimming to decorate the scallops. Use the same process for the header of the side panels. 3. Clip the metal rings to the points in the scallop and slide them over a curtain rod over the vertical blinds. Place the valance on each of the side panel to make the three pieces look like a seamless piece. Tie the side panels back with a tassel to keep it from hindering the operation of the vertical blinds. These curtains and valances will frame your vertical blinds and will up the “wow” factor of your motorised vertical blinds. Check out our line of vertical blinds; these all come in several shades and colours that can complement any room in any style.